Born in Peru, Martin is a pioneer of Peruvian food in Britain. In Andina, his second cookbook, he celebrates his love of the Andes, its dishes, ingredients, people and culture. With a focus on bold flavours and bright colours, Martin's recipes cover breakfasts, snacks, salads, ceviches, stews, soups, desserts, drinks and more. This dessert always delights - from above it looks like a field with a sprinkling of flowers and, once you dip in your spoon, you'll find an utterly delicious and indulgent combination of fruit, chocolate and coffee. Originally, this recipe used tumbo, which is a fruit native to Peru. However, passionfruit will do very nicely. Put the cream in a bowl and whisk until it forms soft peaks. Add the dulce de leche and a pinch of salt and stir gently until well combined, trying not to knock out too much air. In a separate bowl, whisk the egg whites until they form stiff peaks. Fold a large spoonful of the egg white into the cream mixture to loosen, then fold in the rest, again making sure you keep in as much air as possible. Cover and place the bowl in the fridge for about 20 minutes until well chilled. Meanwhile, make the passionfruit sauce. Put the passionfruit puree and the syrup or sugar in a small saucepan over a low heat. Heat gently, stirring until the sugar (if using) has dissolved, then increase the heat to medium and reduce the liquid until the sauce is the consistency of a thick syrup (about 4-5 minutes). To make the edible dirt, preheat the oven to 150 degrees. Mix together the cornflour, quinoa flour, baking powder and caster sugar in a bowl with a pinch of salt. Rub in the butter until the mixture resembles fine breadcrumbs. Add the egg yolk, vanilla extract and milk and combine to form a smooth dough. Roll the dough between 2 sheets of greaseproof paper as thinly as possible, then transfer to a baking tray and remove the top sheet of paper. Bake for about 20 minutes until golden brown. Remove the dirt from the oven and allow it to cool, then crumble it finely and mix with the cocoa powder and espresso powder. To assemble the dish, spoon a portion of the mousse in the middle of a serving plate. 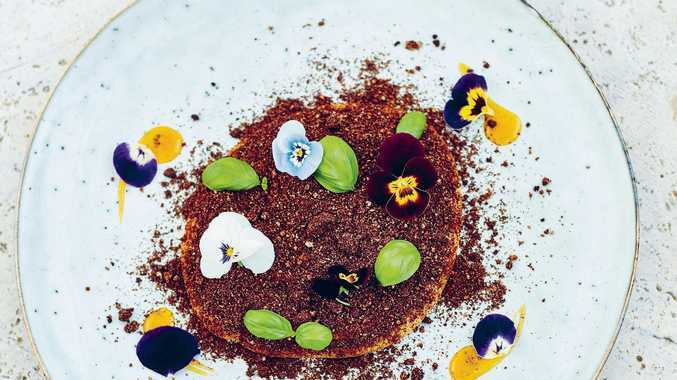 Sprinkle over a generous quantity of the edible dirt and dab or spoon over some of the passionfruit sauce, then decorate with the edible flowers and basil micro herbs so that the dish resembles a garden.